This is the card I did most of yesterday at the little craft group I go to. Loads of layers, The book is 4 layers, ontop of 4 layers of matting. The ponsetia and greenery is another 3 layers, the book and flower are done with silicon glue to raise them and the Happy Christmas is only one pad high. A lot of work in that, Alison: beautiful colour combinations, gives it a lovely vintage look. Hope she appreciates it! i bet it's even better IRL with the gold card, very impressive. 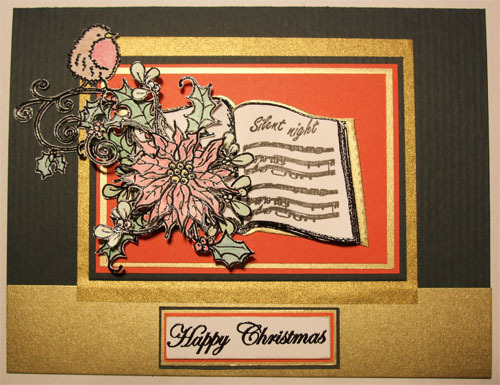 Lovely card, lots of work. Lovely card and some very intricate detail there Alison.